How does training volume differ between training to failure, avoiding failure, and using advanced techniques? Muscle growth happens through an increase in the volume of individual muscle fibers. Individual fibers increase in size after they have detected a certain level of mechanical tension, which they themselves create. This level of mechanical tension is produced when a fiber is activated and shortens slowly, because the active force-velocity relationship is the main determinant of its ability to exert force. The fibers inside a muscle are activated by motor units, but the number of fibers controlled by each motor unit varies widely. Low-threshold motor units control small numbers of unresponsive fibers, which do not grow very much after training. High-threshold motor units control larger numbers of responsive fibers, which grow substantially after training. Therefore, the strength training stimulus that triggers hypertrophy is the length of time for which the fibers controlled by high-threshold motor units are activated and shorten slowly. Contractions at faster movement speeds, or those which do not activate the fibers controlled by high-threshold motor units, do not stimulate much hypertrophy. This affects how we measure training volume, because some reps in a set will contribute to muscle growth, while others will not. In my previous article, I proposed that when training for hypertrophy, we should only count reps that recruit high-threshold motor units while bar speed is slow. We can call these the “stimulating reps” because they are the only ones that can contribute to muscle growth. In this follow-up, I explain how training volume differs between training to failure, avoiding failure, and using advanced techniques. How should we measure training volume when training to failure? When building the model in previous article, I assumed that muscle growth is triggered by reps that correspond to (1) the level of motor unit recruitment, and (2) the bar speed used when training with heavy loads (1–5RM). In this model, when training to failure with loads that are lighter than 5RM, the earlier reps provide little or no stimulus. Only the final 5 reps of a set are stimulating, as fatigue builds up. This assumption depends on the level of motor unit recruitment and bar speed achieved with a 5RM load, and the true number of reps may be higher or lower than 5 (more likely lower than higher), and probably differs between individuals and between muscle groups. Each set of reps to failure with a load lighter than or equal to 5RM involves 5 stimulating reps per set. Loads that are heavier than 5RM (1–4RM) involve fewer stimulating reps per set, which is why more sets need to be done with heavier weights, than with either moderate or light weights, to produce the same amount of hypertrophy. How should we measure training volume when avoiding failure? Many people do not perform every set to failure, and stop a number of reps short of failure on at least some sets. In practice, the best way to track proximity to failure is to record the number of repetitions in reserve. One repetition in reserve (1RIR) means stopping one rep before failure, two repetitions in reserve (2RIR) means stopping two reps before failure, and so on. Importantly, the number of repetitions in reserve affects the number of stimulating reps per set. 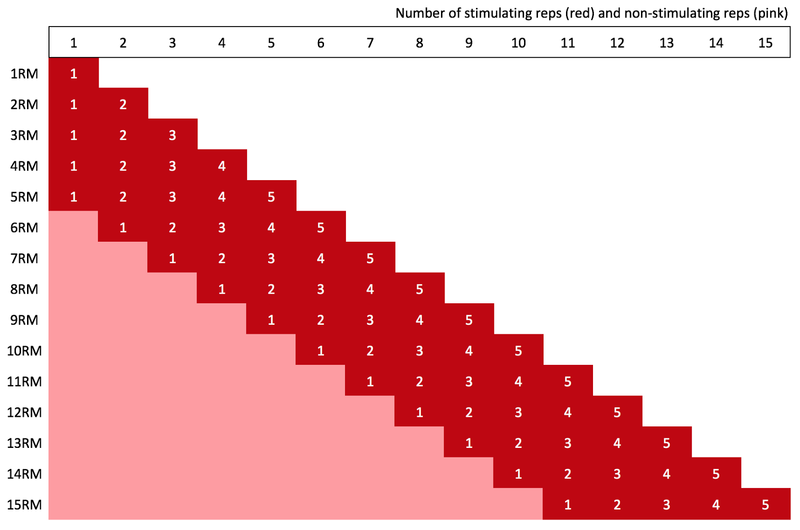 The following chart shows what would happen to the number of stimulating reps per set, if we used a range of loads with one repetition in reserve (1RIR). For loads equal to or lighter than 5RM, the number of stimulating reps is always 4 reps, which corresponds to 5 reps less 1RIR. For loads heavier than 5RM, there is a progressive reduction in the number of stimulating reps, and 1RM cannot be performed at all. When doing multiple sets, if we want to achieve the same number of stimulating reps while avoiding failure, we may need to do an additional set. For example, when performing 3 sets to failure, the number of stimulating reps is 3 x 5 = 15 reps. When doing 3 sets with one rep in reserve, the number of stimulating reps is 3 x 4 = 12 reps, but by adding an extra set, we can more-or-less equate the number of stimulating reps (4 x 4 = 16 reps). The further away from failure we train, the more additional sets we will need to do, to equate the number of stimulating reps.
For example, when performing 3 sets to failure, the number of stimulating reps is 3 x 5 = 15 reps. However, when doing 3 sets with 2RIR, the number of stimulating reps is 3 x 3= 9 reps, and we need to do 2 additional sets to equate the number of stimulating reps (5 x 3= 15 reps). How should we measure training volume when doing straight sets? Straight sets involve multiple sets of the same number of reps in each set, with the same weight. Early sets involve training while a long way from failure, while the final set usually involves going to failure. Obviously, this means that the number of reps in reserve in each set decreases from one set to the next. This *can* affect the number of stimulating reps in each set, depending on whether loads that are heavier or lighter than 5RM are used. When using heavy loads that are equal to or heavier than 5RM, the total number of reps is equal to the number of stimulating reps. When using moderate loads, however, things are very different. When using loads that are lighter than 5RM, we need to use the repetitions in reserve calculation to identify how many reps of each set can be counted as stimulating reps. When using a program of 5 sets of 10 reps, the first two sets provide no hypertrophic stimulus, and there are 10 stimulating reps across the remaining 3 sets (2 + 3 + 5). 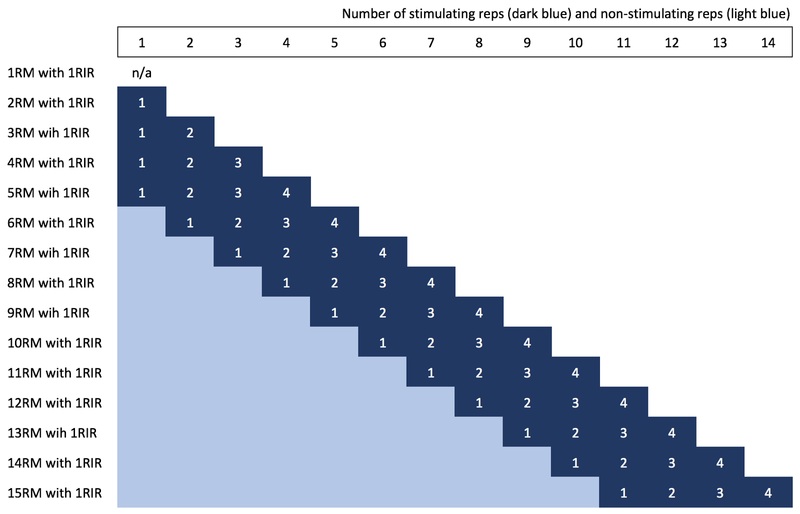 Despite involving a larger number of reps, the hypertrophic stimulus is two thirds of the one provided by 3 sets of 5 to failure (15 stimulating reps). Therefore, although straight set methods like 5 sets of 10 reps are intended to be “volume” programs, they probably provide a smaller hypertrophic stimulus than programs that involve 3 sets of 5 reps to failure. How should we measure training volume when using advanced techniques? Two common advanced techniques that have been researched in relation to hypertrophy are drop sets and rest pause. Drop sets involve doing an initial set to failure, after which the weight is reduced (by approximately 20%) and an additional “drop set” is immediately performed to failure, taking as little rest as possible. As many “drop sets” can be done as desired, simply by reducing the load after each one. Some research has suggested that drop sets may produce greater muscle growth than a similar number of conventional sets, when training to failure. However, not all studies have found this beneficial effect. Why drop sets might be able to outperform multiple sets to failure is unclear. Smaller gains in muscle size occur when short rests are taken between sets (because of a reduced muscle protein synthesis response), and multiple sets to failure with short rests are very similar in nature to drop sets, except they do not involve reducing the weight. Exactly how reducing the weight from one set to the next might have such a large effect on the resulting muscle growth is difficult to understand. In any event, in this model of training volume, when each drop allows at least 5 reps to be done, then drop sets are essentially equivalent to doing multiple sets to failure. In practice, this means that drop sets allow a large number of stimulating reps to be performed, very quickly, making them a very efficient use of workout time. Rest pause involves a very similar approach to drop sets, but involves keeping the weight the same. Some research suggests that rest pause may produce superior hypertrophy to standard, multiple sets, but such studies have not equated the number of stimulating reps, because the standard sets are not performed to failure. Common rest pause workouts involve an initial set performed to failure with a moderate weight, after which short rest periods are taken (10–20 seconds) before additional sets are performed to failure with the same weight. Unlike drop sets, which can involve similar numbers of reps on the initial set and on the “drop sets,” rest pause involves far fewer reps in the later sets than in the initial set, since the weight remains the same. In practice, it is usual that fewer than 5 reps are performed after each pause. How do each of these training methods compare? In this model, any training method that uses the same number of stimulating reps should lead to similar muscle growth. However, this does not mean that each training method has exactly the same effects. Training to failure leads to greater muscle damage, which increases the time required to recover before the muscle can be trained again. Similarly, training using larger numbers of reps also tends to increase muscle damage, which increases the time required to recover. And finally, using shorter rests seems to increase muscle damage, at least compared with moderate rests. Minimizing the number of times reaching failure, minimizing the number of total reps (relative to stimulating reps), and avoiding short rests are therefore important variables to consider when programming for hypertrophy, because they allow a higher training frequency for each muscle group. At one end of the spectrum, there is rest pause, which involves reaching failure 6 times per exercise with short rest periods, but requires the least total volume (20 reps). Obviously, the exact number of times that failure is reached depends on the duration of the rest periods. At the other end, there is 5 sets with 2RIR, which does not involve reaching failure or using short rests, but requires 50 reps to reach our requirement of 15 stimulating reps. However, it is probably not a great idea to train to failure quite so many times (especially with short rest periods), nor do so many non-stimulating reps. In the middle, there are 3 sets to failure, which involves training to failure 3 times per exercise and 30 total reps, and 4 sets with 1RIR, which does not involve reaching failure, and requires 40 total reps. Assuming you want to use moderate loads, as most bodybuilders do, which of these options you choose is probably going to be personal preference. When training for muscle growth, the best way to measure volume is to count only “stimulating reps” that involve the recruitment of high-threshold motor units while bar speed is slow. Stopping short of failure reduces the number of stimulating reps per set. When training with 1–2 repetitions in reserve, we need to do extra sets compared to when training to failure. Moreover, the more repetitions in reserve we leave on each set, the more additional sets we need to do. When training with moderate loads and straight sets, which use the same load for the same number of reps across multiple sets, the number of stimulating reps is much lower than the number of total reps, because the early sets are too far from failure to be counted. Such programs provide little stimulating volume, despite being classified as “high volume” approaches. We can compare the effectiveness of different approaches, including advanced techniques, by assessing their capacity for producing muscle damage, compared with their stimulating effect on muscle growth. Features that enhance muscle damage are higher numbers of total reps, more frequent training to failure, and shorter rest periods.